As a child, one looks forward to many events throughout the year – birthdays, Easter, Christmas, to name a few. I looked forward to all of those myself! In fact, Easter is memorable for me because it meant that Cadbury Creme Eggs would be in season (oh, and for some reason, the Wizard of Oz would always air on TV each year just before Easter; I love that movie!). Of course, candy isn’t the point of Easter, but I was a kid and couldn’t think past the chocolate! In the US, or at least in my little pocket of Indiana, Cadbury chocolate only comes out once per year – at Easter. While I spent the vast majority of my life in the US, I didn’t even know Cadbury made anything else but Creme Eggs. The realization that Cadbury makes other chocolates came during a class trip to Europe, where I saw Cadbury-everything. Wow! Now living in Australia, it is obvious that Cadbury is one of the most popular – if not the most popular – brand of chocolate. Cadbury chocolate comes in all different varieties, from the good old Dairy Milk milk chocolate block, to Turkish Delight, to Mousse chocolate blocks. 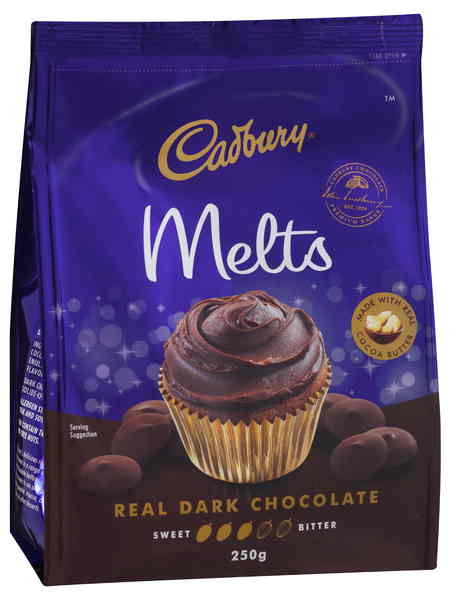 Recently, Cadbury Australia offered to send me products from their new range of baking chocolate to try at home, of which I was super excited about. 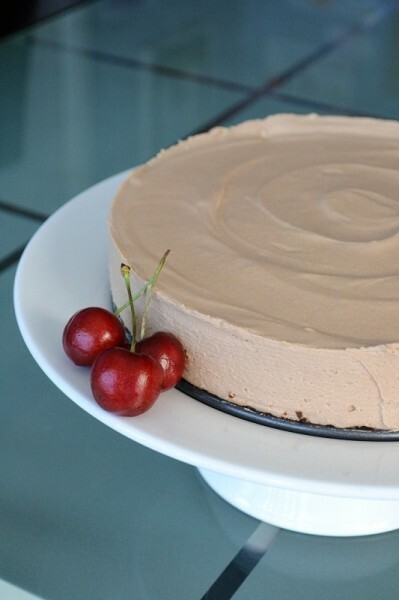 It didn’t take long to choose some recipes to make with the chocolate; I took one look at the milk chocolate cheesecake on the front of one of the packages and knew I’d be making it! Another recipe I chose came from Cadbury Kitchen, where each recipe has been tested to ensure your success at home. There is nothing like a big box of chocolate to make you happy! 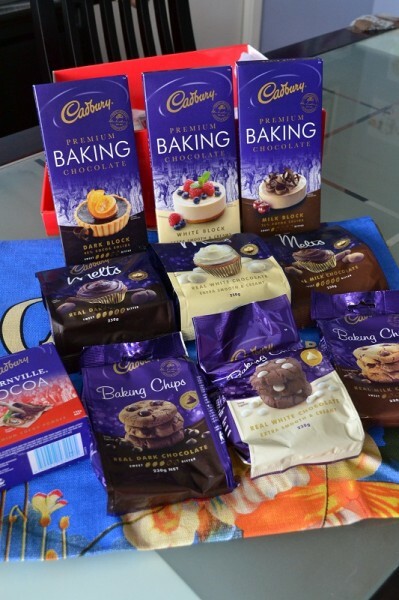 In the box was each product from Cadbury Australia’s new baking chocolate range. I think the packaging looks fantastic – I just love that dark purple! They also included a beautiful large tea-towel, which is pictured underneath the chocolate, above. 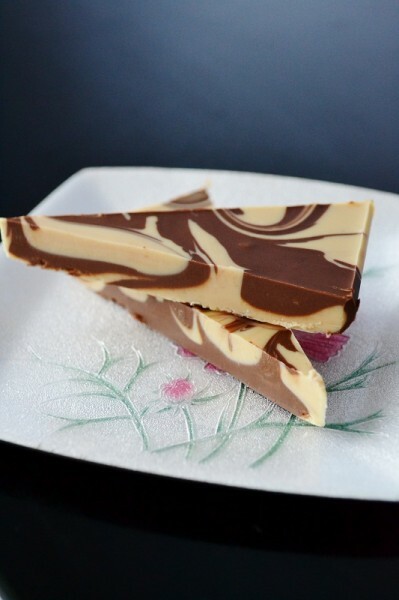 First, I made the milk chocolate cheesecake, which is pictured on the front of the big milk chocolate baking block. If you’re a little timid about baking cheesecakes, you can relax with this one – it doesn’t need to be baked! The list of ingredients is easy and simple, and the preparation is a breeze. I did have one relatively minor issue with the recipe, however. The base of the cheesecake is a chocolate biscuit/cookie-crumb base (I used Arnott’s Ripple biscuits). The recipe says to grease the springform pan, and I did that. I briefly considered placing some baking paper on the bottom though in case the base would stick, but in the end, I just followed the recipe. When it came time to slice the cake, I found that the base stuck solidly to the pan. I nearly had to transfer the slice of cheesecake to the plate, then pick the biscuit base off the bottom of the pan with a fork and place it on the plate next to the cheesecake! Next time, I will definitely use that baking paper, and I recommend that you do as well. So how did the no-bake cheesecake taste? Amazing! It was a hot day that I made the cake, and I thought it was perfect to cool off with for dessert. The texture was smooth and velvety, almost mousse-like. It’s a very impressive cake that would work for dinner parties as well, and because it’s so quick and easy it’s no problem to make at the last minute (but mind the 2-hour setting time in the refrigerator). Inspired by the picture on the front of the packaging, I also made some (rather large) chocolate curls to decorate the slices. Luckily, I was able to get most of the biscuit base on this slice for the photo! 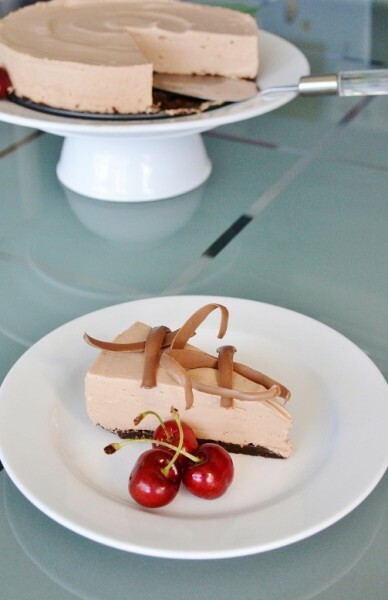 You can find the recipe for this Milk Chocolate Cheesecake at Cadbury Kitchen, as well as on the package of the milk chocolate baking block. The second recipe I chose was for peanut butter fudge. Only 3 ingredients to this recipe! It probably can’t be considered real “fudge” because of these ingredients, but it does have a smooth, creamy texture that definitely resembles fudge. I’m actually very excited about this recipe and can’t wait to share it with you! Well, if you use the right size pan, you will probably have a thicker fudge, but how pretty is that? I don’t have the size of pan used in the recipe, so I used the closest I had, which was longer and made the fudge very skinny! The swirling is easy. I just spooned alternate chocolates into the pan, so I ended up with a sort-of checkerboard pattern. For the next layer, I just reversed the checkerboard pattern. When all the chocolate was used up, I banged the pan on the countertop to level it, then took a butter knife and gently swirled the chocolates together. You only need to swirl once – don’t keep swirling, or you’ll just end up mixing the chocolates together and it won’t look so pretty. This fudge is delicious, and tastes even better on the next day. And here’s the best part – if you love Reese’s Peanut Butter Cups, then hold onto your hats, because the taste of this fudge is very similar to Reese’s. It is so delicious! It keeps very well in the refrigerator. I made this fudge 4 days ago and I still have some left, which tastes as good as the day I made it. I’d say it’ll keep for at least a week in the refrigerator. 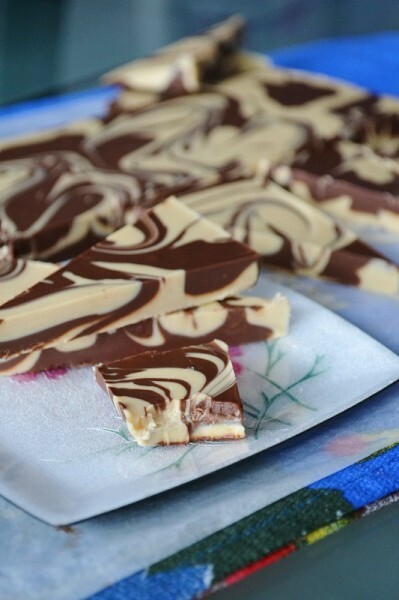 You can find the recipe for Easy Peanut Butter Fudge at Cadbury Kitchen. 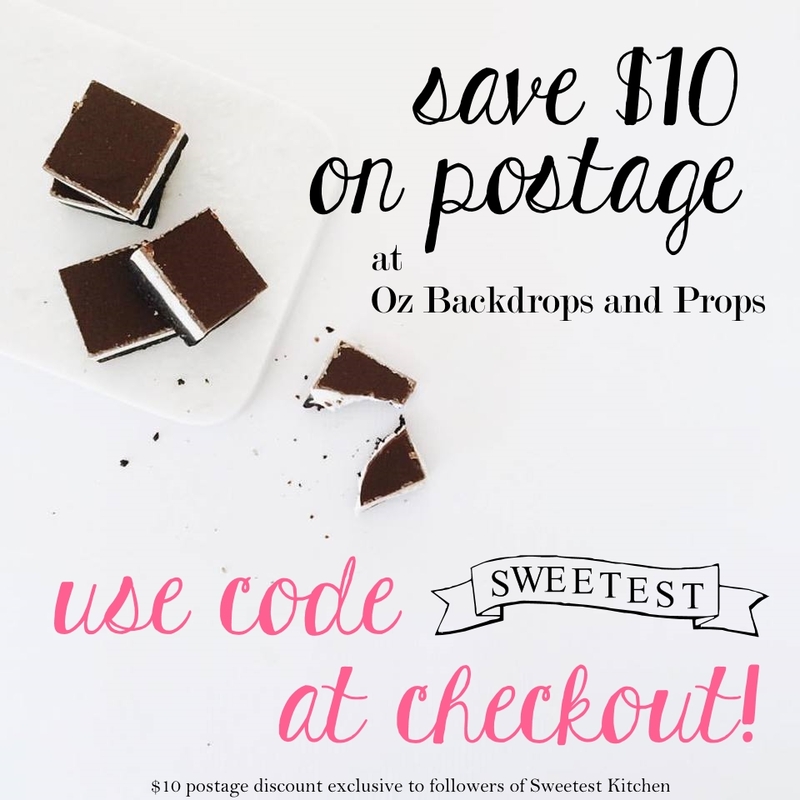 Overall, the new baking chocolate range is fabulous and I can’t wait to use the rest of the chocolate. I love how smooth the chocolate is when it’s melted and it’s got that lovely glossy look to it. 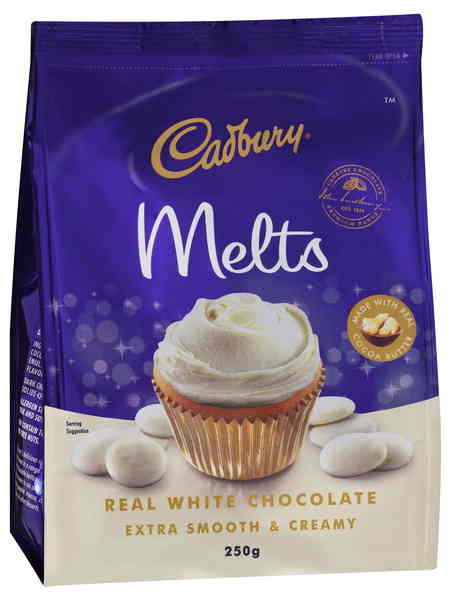 Regarding the chocolate melts, I have never liked the taste of any particular brand’s melts on their own, but I will honestly say that Cadbury’s melts taste better than any previous melts I have tasted. What is great about the baking chocolate is that it’s all real, delicious chocolate – even the white chocolate contains at least 23% cocoa butter. If the white chocolate you use does not contain cocoa butter, then it is not real white chocolate (this is one of my biggest pet peeves!). So there you have it, a glowing, positive review on Cadbury Australia’s new baking chocolate range! I would, without a doubt, recommend the products to you to try yourself. And if you can’t decide on what to make with it, check out Cadbury Kitchen and I’m sure you’ll find something delicious there (this chocolate mud cake with baked pears is what I’m making next!)! Looks absolutely delicious! I love Cadbury Chocolate so I know I would LOVE this!